Produced by Toru Hirayama (平山 亨, Hirayama Tōru) and designed by Shotaro Ishinomori (creator of Cyborg 009), Kamen Rider premiered on April 3, 1971 initially intended as an adaptation of Ishinomori's Skull Man. 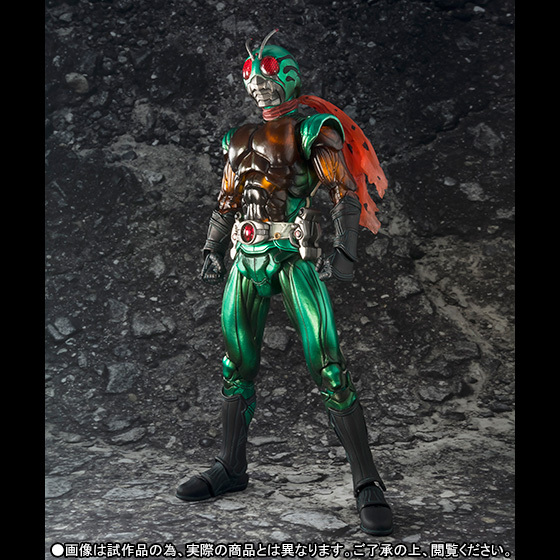 He and Hirayama redesigned the main character to resemble a grasshopper. The hero Takeshi Hongo, played by actor and stuntman Hiroshi Fujioka, was described as a transformed human (改造人間, kaizō ningen) (cyborg). During the filming of episode 10, Fujioka was thrown from his motorcycle during a stunt and broke both legs. His character was phased out until the introduction of another transformed human, Hayato Ichimonji (played by Takeshi Sasaki) was introduced in episode 14. The return of Fujioka and his character, Hongo, in episode 53 united the two actors and Kamen Riders 1 and 2 appeared in every show of the first half of the Shōwa series. The series from April 1971 to January 1976 (Kamen Rider, V3, X, Amazon, Stronger) included a recurring mentor, Tobei Tachibana.